Order the 2018 1oz Dragon Rectangular Silver Coin Now! The new 2018 1oz Dragon is the Perth Mint's first ever rectangular silver coin and sure to pique the interest of collectors. Sporting a stunning Lunar dragon reverse design and struck from one troy ounce of .9999 silver, this limited-edition coin is certain to be snapped up quickly. Order today with coininvest.com and be among the first to own this superb new coin bar. The Chinese Lunar dragon represents wealth, prosperity, power and strength and these mythical creatures are also said to reign over water and weather. The Chinese Dragon is a fitting subject for the very first rectangular gold and silver coins from the Perth Mint. 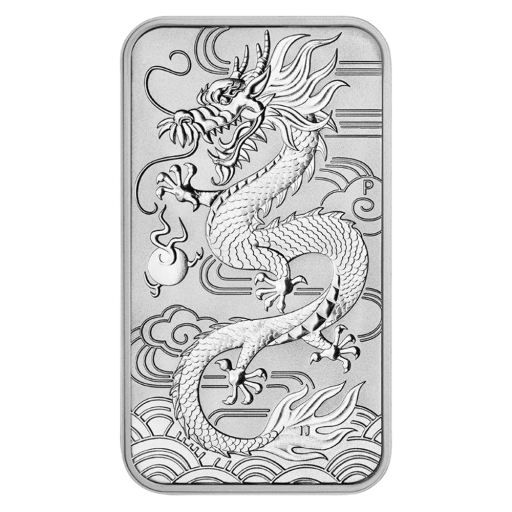 The reverse of the one ounce 2018 Lunar Dragon rectangular silver coin features the beautiful dragon design by artist Ing Ing Jong alongside the Perth Mint's 'P' mintmark. The obverse carries the famous Sir Ian Rank-Broadley coinage portrait of Her Majesty Queen Elizabeth II accompanied by the words 'Elizabeth II Australia', and the coin's weight, year of issue, face value and purity. 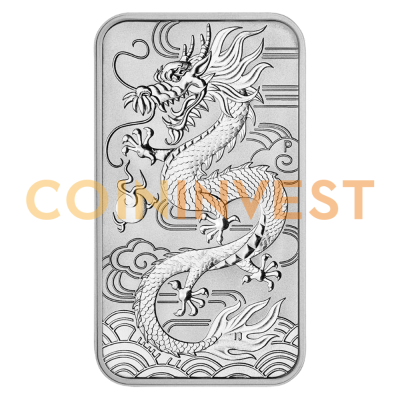 Why choose the 1oz 2018 Silver Dragon rectangular coin? Expected to be one of the year's most popular releases, the 2018 1oz Silver Dragon rectangular coin is a great addition to any collection and it's also a smart choice for investors. Legal tender with a face value of $1 (AU). The one ounce 2018 Lunar Dragon rectangular silver coin has a limited mintage of just 500,000 and it's available singly, in tubes of 20 or invertors boxes of 200. Demand is expected to be high due to the unique format and relative rarity, so it’s well worth ordering in advance with CoinInvest. 1 The weight displayed is the fine metal content of the item. It does not reflect the actual weight of the product which may be higher. * The delivered products may vary slightly from the picture shown.